The SIPA | World Banks on Fire! The world banking system continues to be a series of near misses and impending disasters time and time again despite multiple close calls. In “Man on Fire” we chronicled a young fool who continually played with fire and it almost cost him so much and here we are in 2016, almost 8 years from the Bank Bailout and what have we learned? Banks continue to be obsessed with playing with fire. This is not some modern day phenomena that just happened over the last decade or so. This has been a 100 year pattern of abuse by the banks that consistently seek the highest returns by over investing in the riskiest assets. There was once a time when banks loaned people money to buy a house and received a modest interest rate with a piece of real estate as collateral. Somewhere along the line the banks began having an insatiable appetite for higher rates of returns but to attain higher rewards, you must take higher risks. The Stock market crash of 1929 is often referred to as ‘Black Monday” and there have been countless stories and analysis about the first big crash on Wall Street. What most people don’t realize is that the crash had nothing to do with the stocks and everything to do with the banks. In order to buy as much stock as possible, investors began borrowing from the brokerages so they can buy even more stock. The Brokerages in turn had to borrow from the banks the money to give to the buyer. In truth its really easy money in an up or flat market. When I had my clearing firm we borrowed money from the bank at approximately 4.5% and then offered it out to clients on margin for 10-11%. Once you get up to 50-100 million or more in margin debits you can see how the bank and brokerages love the easy money. There is just one problem: If the stock that is leveraging it tanks there is a rush out the door to sell the stock and suddenly you can have 100 million in loans secured by only 10 million in stock. This is precisely what happened on Black Monday. The banks were over leveraged into the stock market and the rest is history. After this earth shattering moment it’s obvious the banks would be more cautions in the future right? Banks remained stable for quite some time until the mid to late 1970s when the oil crisis hit home and drove up interest rates to 20% or higher. Since most people can’t buy a home with rates that high they passed a Deregulation Reform act in 1980 that allowed banks to widen their investment appetites and requirements for lending and before long they found high rates of return lending to real estate, speculative investments and limited partnerships and by 1982 FDIC presided over the collapse of over 45 banks and spent nearly a billion dollars buying back toxic assets (sound familiar?) Surely after this crisis, the banks would get back to bricks and mortar banking again right? No more speculation and concentration into one asset class right? The Savings and Loan scandal involved locally owned state banks and allowed them to carry less capital on their books and expanded the amount they could typically invest in. Instead of operating like George Bailey’s “ Bailey Building and Loan” did on “ It’s a Wonderful life” , they were suddenly investing in speculative real estate’s deals, start up ventures with low prospects and leveraged beyond capacity. When all the dust settled over 120 banks failed and 43 billion was lost. This was followed by over investment in S. America by American banks who loved the high rate of returns on Mexican/Venezuelan bonds but never stopped to think about who was behind the curtain as well as the dot.com fiasco in which once again investors were margined beyond belief so they could buy online stocks. The real estate and subprime bank debacle is well documented and by now everyone knows how banks were basically packaging so many derivatives and CMO’s into packages and selling bits and pieces of them that even Enron Accountants thought it was suspicions. The entire banking system was on the verge of complete collapse due to poor lending and speculative lending without any sort of risk control. A trillion was spent bailing out the banks and even today there are still toxic assets on the books that they have no idea what to do with. Politicians put on a stern face, passed all sorts of loans to make sure this will never happen again and here we are 8 years later and not much has changed. JP Morgan lost 6.2 BILLION on one single trader from London who was trading credit synthetic portfolios? Banks continue to pay huge fines for the frauds and mismanagement that occurred over the last 8 years and one would think they have learned their lesson right? Lets check out this little thing called OIL. Oil prices took off around 2004 and have basically gone strait up. Sure there have been an occasional pull back and we get excited at $2.00 a gallon prices for a couple months but then they take the prices back up to as high as $4.50 per gallon. Due to this demand and the prices, a mini oil rush began with drillers both on land and off shore demanding more drills be built, more ships be made to haul and more exploration. The big drilling companies utilize lines of credits and loans with the banks and for nearly 15 years it made perfect sense. Your cost to pull a barrel out of the ground is $50.00 a barrel and you can bring it to market at $100.00 or more a barrel. If you needed more equipment to expand your rigs, need more wells and infrastructure, ll you do is go to your bank and show them margins of over 100%. Unfortunately Banks have been lending under this premise for quite some time and the margins for them were huge, particularly in the Euro National banks. But a funny thing happened along the way to the high returns: Oil finally became priced based on actual demand instead of commodity trading and suddenly oil is $35.00 a barrel. Oops. If it cost you $50.00 to pull a barrel out of the ground or ocean but the market is only $35-$40 a barrel do you pull it? Of course not ,it makes no sense , however there is still that little bank loan that is due. 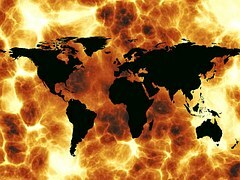 Recently, it was estimated that bank exposure worldwide could approach 1 trillion dollars. As soon as I hear this number the first thing I did was double it because that is always the case with banks and economics and bad news. There could be almost 2 trillion in defaults across the world due to the over leveraged loans because once again the banks refuse to mange risk. They refuse to have set loan call marks in which the loan is called and any sort of common sense when it comes to diversification and concentrating too much risk into one particular area. . 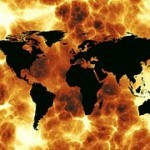 So as we enjoy our sub $2.00 gas prices just remember that same gas price is being used to set the banks on fire …again!